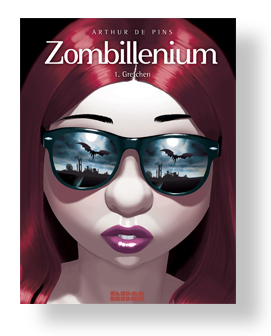 Arthur de Pins’ Zombillenium, Volume 1: Gretchen has made the 2015 Maverick Graphic Novels List, by the Texas Library Association. 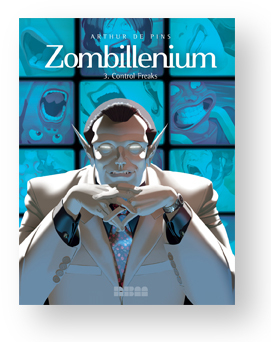 Zombillenium is in the Grades 9-12 (high school) category among other great graphic novels like Batman, by Scott Snyder and Greg Capullo (DC Comics), Mariko and Jillian Tamaki’s This One Summer (First Second) , and March Book One by John Lewis (Top Shelf) and many more. This category has the most selections with 23 graphic novels. The purpose of the list is to encourage students in grades 6-12 to explore a variety of current books. The list is intended for recreational reading, not to support a specific curriculum. Other nominations of note include Gene Luen Yang’s First Second set Boxers and Saints, Raina Telgemeier’s Sisters (Scholastic), and Paul Pope’s Battling Boy ( First Second). See the list here. Zombillenium Vol. 1: Gretchen was called “fresh meat” for zombie fans by Publishers Weekly praising “its humor, clever pacing, and unique approach to the monster narrative.” Comics Waiting Room said it was “a hoot from start to finish”. It also was A Young Adult Library Services Association 2014 Great Graphic Novel for Teens. Zombillenium Vol. 2: Human Resources, released over the summer, is “fiendishly delightful, twisted, surprising, and even a little tragic” according to the Midwest Book Review. Zombillenium Vol. 3: Control Freaks is coming August 2015. Plenty of time to catch up on this hauntingly different series! 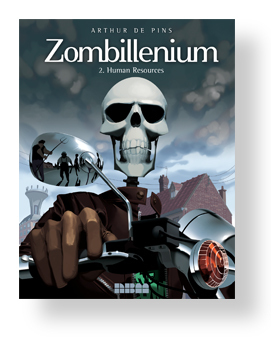 Be sure to visit the Zombillenium site and NBM’s subsection for more information. Next Next post: Run, Dad!